The Old Library, THIS EVENT IS NOW FULLY BOOKED. This illustrated talk explores the significance of a unique discovery in the Edward James Archive at West Dean College of Arts and Conservation - a transcript of the infamous 'diving suit' lecture given by Salvador Dalí at the International Surrealist Exhibition in London in 1936. Although the event is widely celebrated as an example of Dalí's subversive surrealist showmanship, the details of his lecture have remained unknown beyond tantalising rumours and press headlines. Dr. David Stent will reveal details about the text, consider it in relation to Dalí's wider work (from theoretical writing to painting), as well as exploring the significant role played in the event by Dalí's friend and patron, Edward James. An early version of this talk was delivered at the Dali/Duchamp Conference held at The Royal Academy on November 3-4, 2017 and later published in the Journal of Avant-Garde Studies at the Dalí Museum, Florida. Dr. David Stent is an artist, writer, curator and performer whose recent work is concerned with the role of writing in art practice, particularly in association with artists' publications and the use of theory and philosophy in contemporary art. He holds a PhD in Fine Art from the University of Reading and is currently Subject Leader in Visual Arts and Chair of the Research Committee at West Dean College. The unique resource of the Edward James Archive is informing a variety of ongoing projects, including extended research on James' literary output, both published and unpublished. 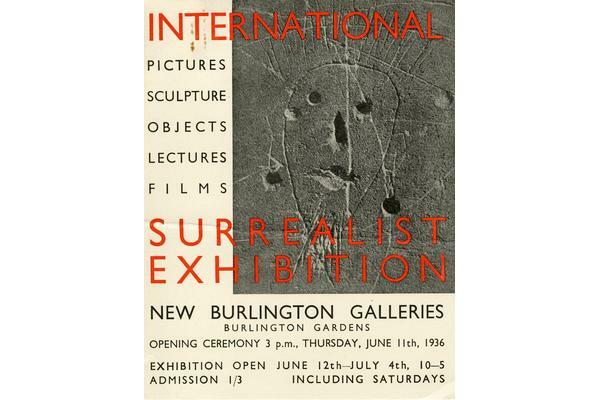 Promotional material for the 1936 International Surrealist Exhibition. Image courtesy of West Dean College, part of The Edward James Foundation. All rights reserved. 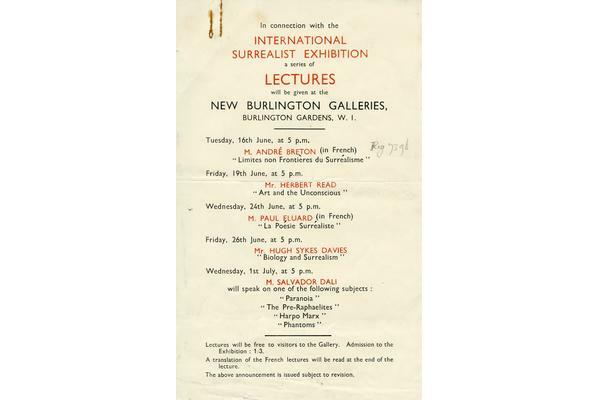 Lecture programme for the 1936 International Surrealist Exhibition. Image courtesy of West Dean College, part of The Edward James Foundation. All rights reserved.